2004: Faculty of Pharmaceutical Sciences, Kyoto University. 2009: PhD course of Pharmaceutical Sciences, Kyoto University, Ph.D.
2009 to 2017 (8.5 years): Postdoctoral Researcher in Taniguchi group of RIKEN. From Oct. 2017: Associate Professor, Gifu University. Dr. Kizuka works on regulation of expression and activity of glycosyltransferases, by biochemical and chemical biology approaches. Taniguchi had purified and cloned various glycosyltransferases and identified various target proteins of these enzymes, and now focuses on glycan-based medical research. Keratan sulfate (KS) proteoglycan is a gigantic molecule, consisting of long linear glycans (dozens at most) bound to a core protein. KS is a type of glycosaminoglycan that comprises repeated acidic disaccharides. Main structure of KS consists of a polylactosamine chain (repeated disaccharide of galactose [Gal] and N-acetylglucosamine [GlcNAc]), and hydroxyls in the disaccharide are sulfated (Fig. 1A). The disaccharide with sulfates at both 6-hydroxyls is designated as L4 and is the main subject of this review. Keratanase-I and -II are often used as degradation enzymes of KS, but L4 is not degraded by these enzymes and is stable in vivo. In addition, Seikagaku Corporation has isolated L4 by digesting shark cartilage-derived KS, studied its action, and found that L4 suppresses cytokine production from macrophages 1. However, detailed molecular mechanisms of L4 action in vivo has not been clarified yet. As described below, we have found that C-type lectin Langerin is a receptor candidate for L4, and examined whether L4 can be used as a therapeutic for COPD through binding to its receptor to regulate immune reaction. So far, we have established 3 kinds of COPD model mice, and using these mice we studied the actions of L4 and their molecular mechanisms. Furthermore, we succeeded in raising the binding affinity of L4 to Langerin by chemically oligomerizing L4. In this review, we describe relationships between glycan and COPD, particularly focusing on L4 and its derivatives. KS is classified into 3 types, KS-I, KS-II, and KS-III, based on its core structure (Fig. 1B). In mammals, KS-I is mainly expressed in cornea, KS-II in cartilage, and KS-III mainly in nervous tissues 2,3. KS-I is present on N-linked glycans carried by several core proteins (e.g., fibromodulin, lumican, keratocan, mimecan). KS structure comprises repeated disaccharides in which Gal is linked to GlcNAc via β1,4 linkage. In corneal KS-I, unsulfated lactosamine, L2 disaccharide with a sulfate at GlcNAc, and L4 disaccharide with a sulfate at both sugar residues are present in mixed amounts. Non-reducing terminals can be capped with sialic acids, and internal fucose residues are rarely found 2,3. KS-II, enriched in cartilage, is bound to O-GalNAc-type glycans that are linked to serine/threonine residue of core protein. MUC1 is known to be a core protein of KS-II. KS-II contains L2, in which only GlcNAc is sulfated, and L4, in which both sugars are sulfated, and hardly contains unsulfated disaccharide. KS-III is mainly expressed in brain and is also highly sulfated. KS-III is bound to O-mannose glycans that are linked to serine/threonine residue of core protein. Abakan and phosphacan are known to be core proteins of KS-III. KS is known to function to maintain water in cornea. Genetic mutation of GlcNAc6ST, which is essential for KS biosynthesis, causes macular corneal dystrophy in which corneal hydration is affected, leading to blindness 4. In recent years, functions of KS in the nervous system have been well studied. KS proteoglycan was reported to inhibit axonal regrowth after injury 5, and the involvement of KS in amyotrophic lateral sclerosis (ALS) was also reported 6. (A) Disaccharide repeat structure of KS. (B) 3 types of KS glycan structures. Next, we would like to describe the history of our glycobiology research and its relationship to COPD. We worked long on a glycosyltransferase FUT8 that is responsible for the biosynthesis of core fucose (α1,6-linked fucose) of N-glycans. We first purified this enzyme from human gastric cancer cell line and porcine brain, and then cloned its cDNA using partial amino acid sequences 7,8. We next generated Fut8 gene-knockout (KO) mice and found that 70% of these KO mice died soon after birth and that the survivors exhibited emphysema-like symptoms. Analysis of respiratory functions of these mice revealed that they resemble human COPD patients 9. One of the causes for this symptom was found to be upregulation of matrix metalloproteases triggered by loss of core fucose on TGF-β receptor in the lung, which results in abnormal destruction of alveolar interstitium 9. Furthermore, Fut8 heterozygous mice are vulnerable to exposure to cigarette smoke (the highest risk factor for COPD) or experimental induction of emphysema by elastase. Whereas 6 months are required to experimentally induce emphysema by cigarette smoke in wild-type mice, only 3-month exposure causes similar lung pathology in Fut8-heterozygous mice 10. Using these mice as a COPD model, we started research on human COPD. Regarding FUT8 and human COPD, we reported an association between reduction in serum FUT8 activity and decline in respiratory function in COPD patients 11, and an SNP in FUT8 gene was also found to be associated with respiratory functions 12. More recently, a novel type of congenital disorder of glycosylation (CDG) was found in which FUT8 expression is severely affected by genetic mutations. This type of CDG was reported to cause systemic symptoms and commonly cause respiratory complications 13. These studies suggest that glycans that include core fucose are implicated in human COPD. COPD is a respiratory disease, previously termed chronic bronchitis and emphysema. Currently, 5 million people are estimated to suffer from COPD in Japan, but among them only 300,000 people undergo treatment. COPD was the 4th leading cause of death in the world in 2012, and it is estimated to become the 3rd in the near future (WHO Health Statistics 2012). COPD is a lifestyle disease, and the highest risk factor for COPD is cigarette smoking. Environmental factors such as PM2.5 could also cause COPD. COPD exacerbation is often triggered by infection of virus or bacteria, including influenza virus, Haemophilus influenzae, and Streptococcus pneumoniae. COPD is also known to be a risk factor for lung cancer. In COPD treatments, bronchodilators such as long-acting β2-agonists, anticholinergics, theophylline, and inhaled corticosteroids are currently used 14, but these drugs are palliative, and development of more fundamental therapeutics is desired. In this review, we describe a possibility that L4 and its analogs can be used as therapeutics for COPD, and describe how these compounds are related to C-type lectin Langerin. As described above, the highest risk factor for COPD is cigarette smoking. By searching for a glycan of which expression level in the lung is altered by smoking, we newly found KS. The expression levels of KS and of mRNAs of KS sulfotransferases were analyzed by immunostaining and real-time PCR, respectively. We also found that the levels of highly sulfated KS stained with 5D4 antibody and of mRNA of the sulfotransferase for 6-position of Gal, Gal6st1 (Chst1), were both downregulated by smoking 15. These results suggest that KS expression in the lung is downregulated by the highest risk factor for COPD, smoking, and that this reduction is involved in pathogenesis. As described above, L4, a disaccharide in which both Gal and GlcNAc are sulfated, was reported to regulate immune function. Based on these findings, we examined whether L4 has an anti-inflammatory effect. 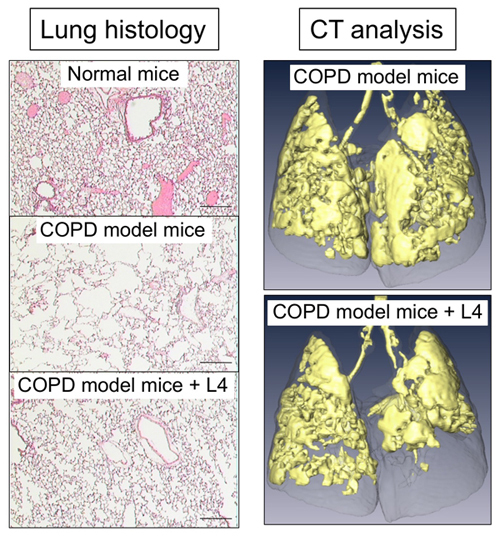 To investigate anti-COPD action of L4 in mice, COPD mouse models are required. We generated two types of emphysema mouse models: Fut8-heterozygous mice exposed to cigarette smoking for 3 months, as described above, and intratracheal administration of elastase to wild-type mice. A COPD exacerbation model was also generated, by further administering LPS to those emphysema model mice to evoke inflammation in the lung 16. Moreover, a CT analysis system was also established, for assessing respiratory functions of these mice (Fig. 2, right). By administering L4 with intratracheal spray or intravenous injection, we examined whether L4 suppresses inflammation and emphysema development in the lung of these model mice. The results revealed that single administration of L4 significantly suppressed development of emphysema, which was assessed by CT analysis and measurement of mean linear intercepts (Fig. 2) 15. We also analyzed the severity of inflammation by counting inflammatory cells and measuring cytokines in bronchoalveolar lavage fluid (BALF), and found that migration of inflammatory cells to the lung and production of inflammatory cytokines were both reduced by treatment with L4. These data showed that L4 suppressed lung inflammation and COPD symptoms in these COPD mouse models. Figure 2: Anti-emphysema effects by L4 in COPD model mice. This figure was modified from a published paper (Gao et al., Am. J. Physiol. Lung Cell Mol. Physiol., 2017, 312, L268-L276). The above findings show that L4 has anti-inflammatory effects in mouse lung, and the next task was to elucidate its action mechanisms. The in vivo functions of KS are still largely unclear. Although specific molecules that interact with KS have barely been reported, Langerin, an animal lectin, was reported to specifically bind to L4 and KS 17-19. Langerin is a Ca2+-dependent C-type lectin mainly expressed in dendritic cells, and serves as a barrier to and is considered to remove pathogens, including HIV 20. However, reports regarding its endogenous glycan ligands are sparse. Langerin has unique specificity of glycan binding, and it can bind both mannose-containing glycans such as mannan and 6-sulfated galactose. As Langerin was shown to bind KS-expressing cells, KS is considered as an endogenous and/or exogenous glycan ligand for Langerin 17. In addition, the number of Langerin-positive dendritic cells was reported to be increased in BALF in COPD patients 21,22. These results and reports suggest that Langerin is involved in COPD pathogenesis and that the suppressive effects of L4 against COPD are mediated by binding to Langerin. However, because Langerin does not have any signal transduction motif, it cannot directly transduce extracellular signals. We are now trying to clarify how Langerin moves in cells upon ligand binding, how Langerin transduces extracellular signals into cells, and how L4 regulates such Langerin functions. Based on analysis using NMR and ELISA, we confirmed that L4 and Langerin directly bind 23. Furthermore, the binding was found to require the 6-sulfate residue of Gal. 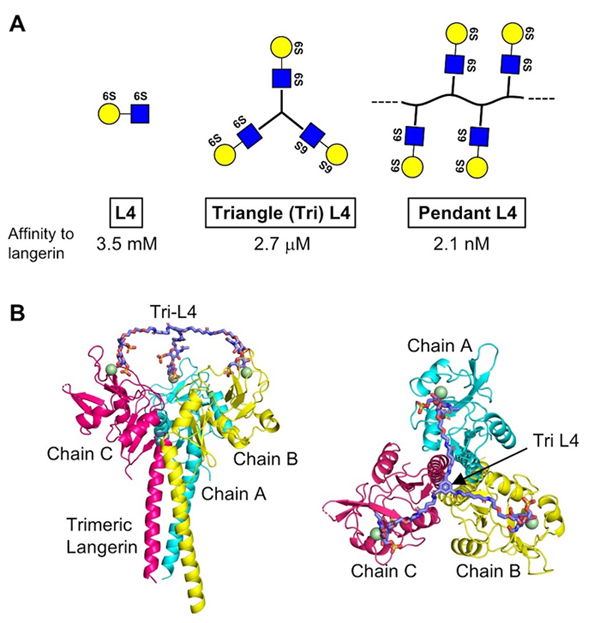 It is known that Langerin forms a trimer through its neck region, and we found that a short form unable to trimerize showed reduced binding affinity to L4. However, even trimeric long form showed the binding constant at mM range, and thus new ligands with higher affinity are expected to show more potent effects in vivo. Therefore, we chemically synthesized trimeric L4, which is designated as Triangle L4 (Tri-L4), and polymeric L4, which is designated as Pendant L4 (Fig. 3A), and measured their binding affinity to Langerin by ELISA. As a result, Tri-L4 and Pendant L4 showed the binding constants at μM and nM range, respectively. This indicates that chemical oligomerization of L4 drastically raised its binding affinity to Langerin. Furthermore, Tri-L4 was also shown to fit trimeric structure of Langerin by our docking model (Fig. 3B). We also examined the binding of L4 and Pendant L4 to Langerin reporter cells, and found that Pendant L4, but not L4 monomer, evoked signal transduction 23. Pendant L4 also showed stronger binding to bone marrow-derived dendritic cells than L4 monomer. Moreover, Tri-L4 showed better anti-inflammatory effects than L4 monomer in COPD model mice. These findings indicate that, in this case, chemical oligomerization of a glycan ligand is effective to potentiate bioactivity by raising binding affinity to its receptor. Figure 3: Oligomerization of L4 and trimeric structure of Langerin. (A) 2 types of L4 derivatives. (B) A docking model of trimeric Langerin and Tri-L4. This figure was modified from a published paper (Kizuka et al., Cell. Immunol., 2018, 333, 80-84). Our research on L4 and COPD showed that glycans can be therapeutic targets of COPD and that bioactivity of a small glycan can be potentiated by chemical derivatization. Currently, we are investigating whether Langerin is really an in vivo receptor of L4, how Langerin transduces signals, and optimizing chemical modification of L4. We expect that such basic research will lead to clarification of glycan functions, and development of new research tools and therapeutics. The research described in this review was accomplished through the great and kind support of many people. In particular, L4 was kindly supplied from Seikagaku Corporation, chemical synthesis of trimeric and polymeric L4 was carried out by Mr. Tetsuya Hirayama of the same company. Dr. Congxiao Gao, Dr. Satoshi Kobayashi, Ms. Reiko Fujinawa, and Ms. Fumi Ota mainly carried out biochemical and animal experiments. Prof. Kozui Kida of Nippon Medical School, the late Tomoko Betsuyaku of the School of Medicine, Keio University, and Prof. Toshitaka Maeno of Gunma University Graduate School of Medicine provided valuable advice for clinical and animal studies in COPD research. We would like to thank all the other people involved in our studies for their support and cooperation. This review is dedicated to the late Professor Tomoko Betsuyaku, who was a genuine expert in basic and clinical aspects of COPD, and the first female professor at the School of Medicine, Keio University.